I know that I said that I wouldn’t overdo the posts this time around, but forming the inner stem is always a momentous occasion. Your forms are in place and you’re finally building. The last few times, I was able to use three standard 1/4″ strips to make the inner stem. This time, I was rewarded by the sound of cracking wood as I bent the strips over the form. Deciding that I didn’t want to hear that sound again, I planed four strips a little thinner and then (as last time) soaked them in the tub in hot water for over an hour. This time, the strips bent well and the end result was a beautiful inner stem mohawk shown below. By the way, I use Gorilla Glue for this part. It reacts nicely with the damp wood and gives a good bond. After some time away from boat building, it was time to reassemble the strongback and get another build underway. For this build, I won’t give a strip-by-strip account, especially if I’ve already posted on a topic, but I will post on things that I’m doing a little differently this time around. For this build, I’ve decided to clean up the strongback a little by including a better shelf, which comes in handy for clamps and tools. The shelf is held supported by 1×4 stock into which the forms are screwed. 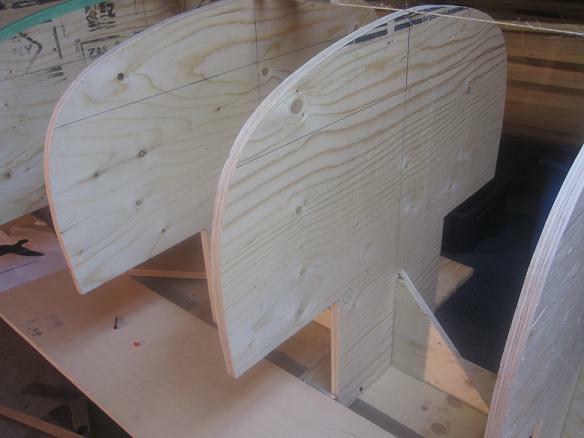 Note the right angles to ensure that the forms are straight. 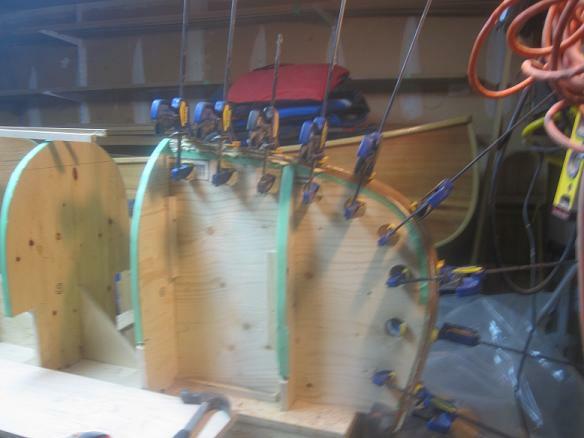 The shot below shows the forms in place with a string stretched between the end forms to ensure that everything is straight. The string shows you if the forms are centered, but it won’t show you if the forms are off in other ways. 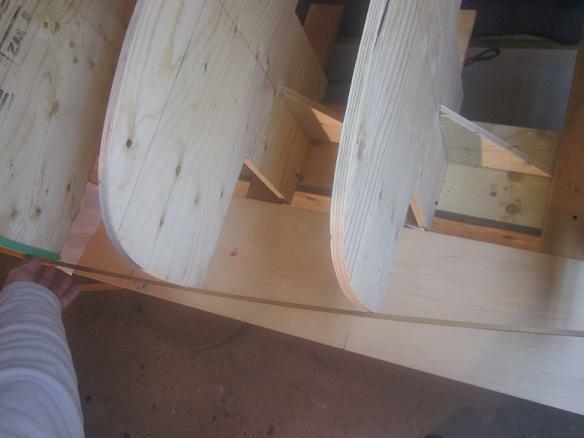 For instance, if you traced the outline of the form onto the plywood a little shy and cut the form a little shy as well, then the form may not be as wide as it should be. While this deviation won’t be obvious just by looking at it, it will certainly become evident when you start stripping the canoe. One quick test is to take a 36+ inch length of cedar and run it along each form. If, for example, you hold the strip against forms 1 and 4, it should touch strips 2 and 3. There should be no gap and the curve of the strip should be smooth. It’s a very easy test and it gives you the peace of mind that the strips will run smoothly when you begin to build. You are currently viewing the archives for January, 2013 at greybeard canoes & kayaks.